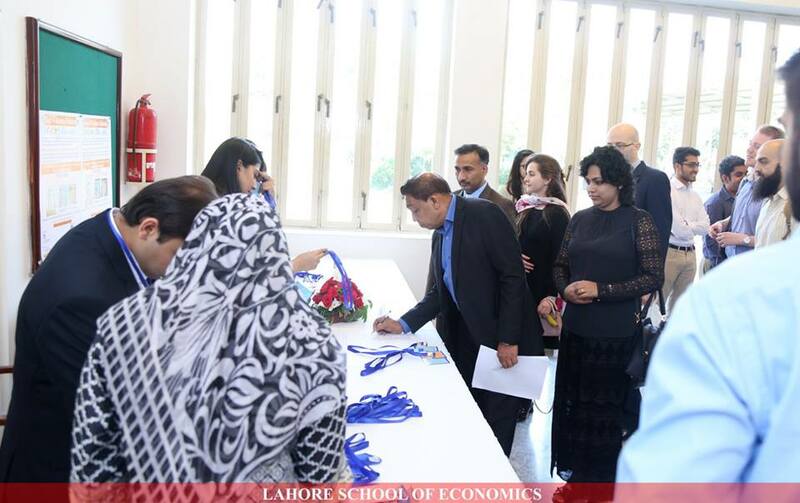 The Lahore School of Economics hosted its Thirteenth International Annual Conference on Management of the Pakistan Economy at its Main Burki Campus on the 29th of March, 2017. 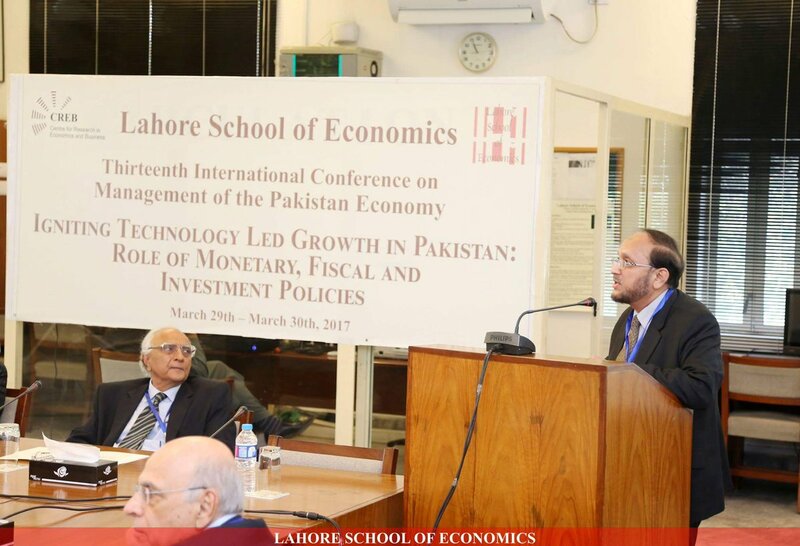 The theme of this Conference is “Igniting Technology led growth in Pakistan: Role of Monetary, Fiscal and Investment Policies”. 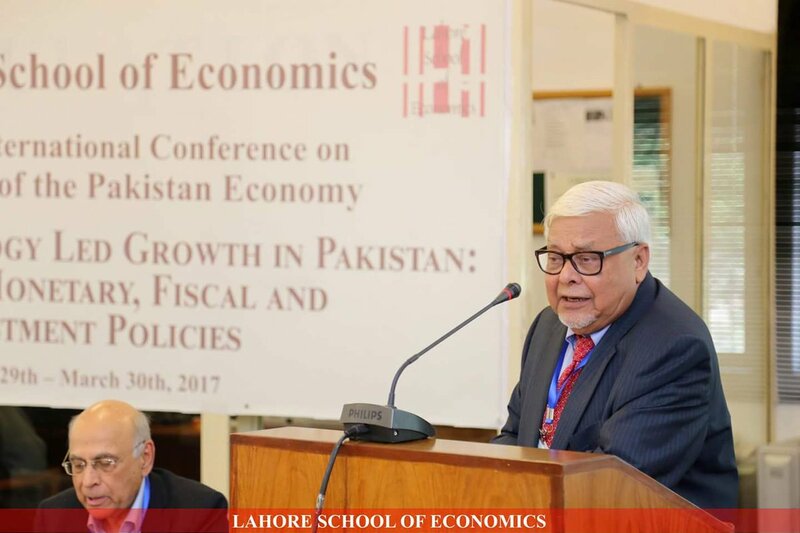 The two-day event will be devoted to discussions on past successes and constraints on technology-led growth and to draw guidance on how macro and micro level policies can contribute to accelerating economic growth in Pakistan. 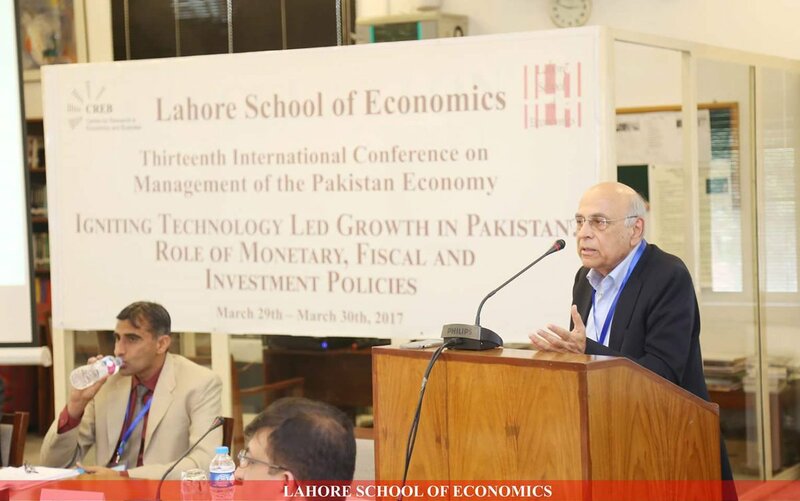 The conference started with a keynote address by Dr. Shahid Amjad Chaudhry (Rector, Lahore School of Economics) to set the stage for the detailed discussions held at the Conference to explore how monetary, fiscal, investment and governance policies can help ignite Technology Led Growth in Pakistan. He remarked that the issues the Conference aimed to address are very relevant to the issues confronted by Pakistan’s economy at present. He shared his experience as Pakistan’s Advisor on Finance, Revenue, Planning, Economic Affairs and Statistics in the Caretaker Government of 2013. In April 2013 Pakistan was facing a very severe foreign exchange crises and Pakistan’s International reserves had been run down to negligible levels – to about 4 to 5 billion dollars. Both the World Bank and ADB had stopped new adjustment lending to Pakistan and as a result Pakistan was making a net transfer of about $2 billion to these institutions. In these circumstances, Dr Shahid Chaudhry led an economic team to the IMF that successfully negotiated an Extended Fund Facility (EFF) which was substantially longer term and on more favorable terms than the previous 3 years IMF Standby that was on offer; an EFF fiscal deficit reduction target of 2 percent of GDP per annum from 2015-16 levels for the next three years proposed by the IMF; and that the IMF Programme would be strictly limited to the macro-economic stabilization mandate of the IMF and that sectoral conditionality would be left to be separately negotiated with the World Bank and the ADB. The fiscal deficit reduction target was modified at Dr Shahid’s insistence to allow half or 1% of GDP of this reduction target to be used for poverty reduction and social support programmes to mitigate for the adverse income distribution effects. Giving full credit to the Government of Pakistan’s Finance Team led by Finance Minister Ishaq Dar, which subsequently held detailed negotiations with the IMF and subsequently signed the IMF 2013-16 EFF Programme, he said it was important to note that the present Government implemented this program. 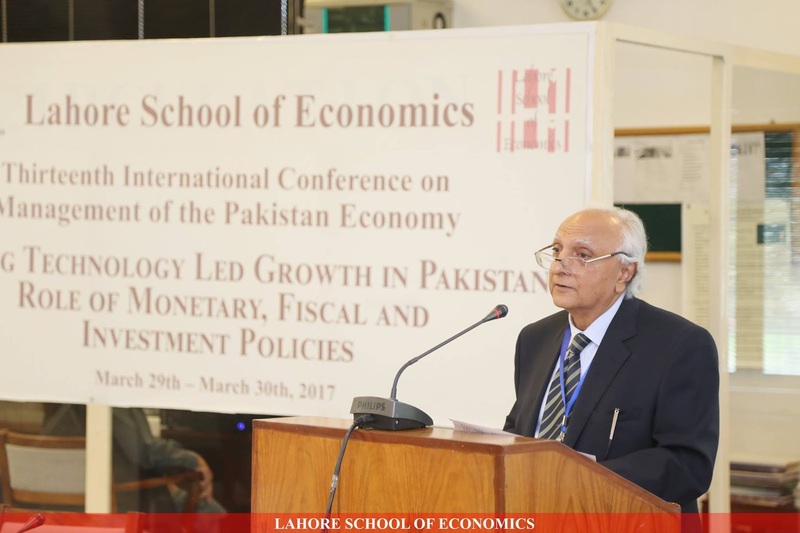 As a result Pakistan has now successfully stabilized its economy and emerged considerably strengthened with regard to the macro economy. 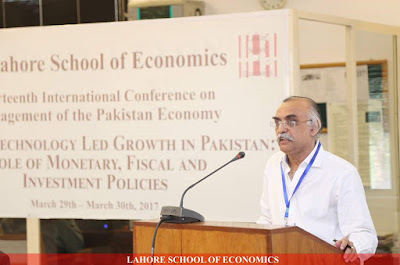 He said that Pakistani economic system is stable - the country’s $300 billion economy in current dollar terms and $ 1 trillion economy in Purchasing Power Parity terms is growing under the impact of the sizable purchasing power of a huge middle class (roughly 50 percent of the population), a very large urban population (60-65 percent of the population) and a self-sufficient agricultural economy. However, Dr Shahid wanted to audience to reflect on the important question of they day: Should we carry on doing what we are doing currently, especially with the arrival of the Chinese Pakistan Economic Corridor (CPEC) foreign investment of about US $50 billion? The answer, as most observers would agree, is that we must, and can, do better. A good starting point is to focus technology. We have mastered and excelled in all technologies that we have considered essential. Yet in the other 90% of the economy our technology is 50-80 years behind the times. Dr Shahid Chaudhry summarized the belief held by economists at the Lahore School of Economics, that that this absence of modern technology adoption is due to factors that we normally do not focus on when discussing technology adoption - that is the monetary, fiscal, investment and governance policy frame-work which drives the economy. Accordingly, the thirteenth Internal Conference on Management of Pakistan Economy is aimed at exploring the reality of Pakistan’s macro-economic frame-work which has been badly battered by the security situation and economic mismanagement and learn from the experience of other countries. The first session of the Conference focused on Ensuring Macroeconomic Stability With Micro Firm Level Dynamism. Dr Rashid Amjad (Professor of Economics and Director, Graduate Institute of Development Studies, Lahore School of Economics) began the session with his presentation on Pakistan: How macro-micro interaction has resulted in an undervalued, under performing economy. He emphasized the need to analyse the macro-micro interaction in the economy to fully understand the dynamics of growth and recommended that such an analysis is necessary to frame appropriate policies. Over the last fifteen (15) years, poverty has decreased significantly as remittances have increased. Macroeconomic management has been seriously flawed because it has ignored the impact of the manifold increase in remittance inflows and its far reading impact on the economy. Dr Ahmed Khalid (Professor of Economics, Unversiti Brunei Darussalam) discussed the importance of financial integration and stability for sustainable economic growth. He used data on key financial and real sector indicators from 130 countries in the Asia Pacific over 1989-2013 to establish the link between finance and sustainable growth. Results show a positive and significant relationship between financial integration, foreign direct investment and economic growth for this sample. Carrying forward the discussion on macro and micro dynamism, Dr. Matthew McCartney (Director of South Asian Studies; Associate Professor in the Political Economy and Human Development of India, University of Oxford, UK) explored the ‘middle income trap’ under which growth and development indicators stagnate. He used the example of Bangladesh, where exports seems to be stuck in a low cost, low productivity cycle. He challenged the orthodox view of encouraging growth via competition and technology adoption. For a developing country, technological transfers may perpetuate dependence on imports and mayinadvertently, transfer resources back to developed countries in the form of patents and royalty payments. He argued that attempts to boost productivity would be met with limited success unless they are supplemented with old-fashioned efforts to induce structure change, breaking away from the dependence on agriculture and low-tech manufacturing. Dr Sirimal Abeyratne (Professor in Economics, University of Colombo, Sri Lanka) concluded the first session with a presentation on Network trade and Sri Lankan integration into regional supply chains. He drew attention to the rapid expansion in network trade based on the formation of regional supply chains in South Asia. These supply chains focus on trade in parts ad components and are highly sensitive to trade barriers. In spite of its entry into regional and bilateral trade agreements; Sri Lanka has not integrated into regional supply chains and this may explain why the trade performance has remained limited. Presently, non-tariff barriers make it easier for traders to trade outside of South Asia than within the region. His findings recommend a more coordinated regional effort that facilitates trade to achieve regional growth. 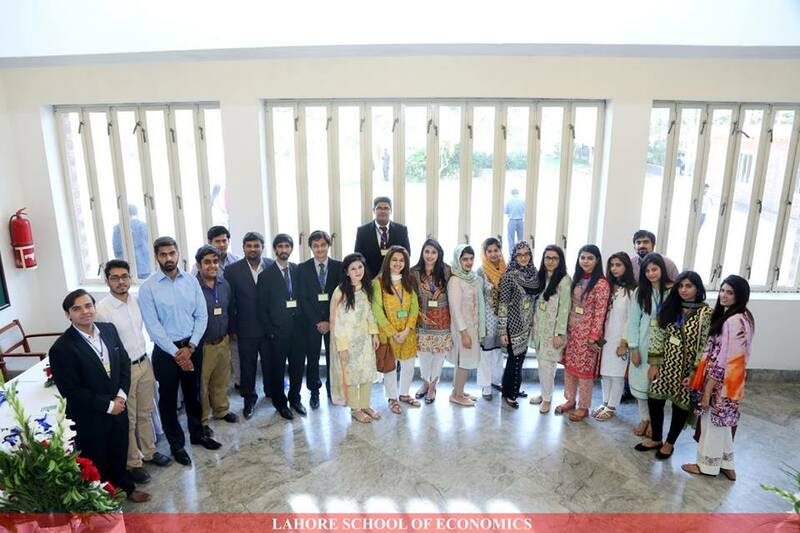 The second session of the Conference focused on Monetary Policy, External Capital and Exchange Rate Management. The first presentation, by Dr Inayat Mangla (Professor of Finance, Lahore School of Economics) and Dr. Kalim Haider (Senior Economist, Monetary Policy Department, State Bank of Pakistan) used quarterly data to explore the role that monetary policy can have in in the presence of macro-level uncertainties such as volatile capital flows, falling remittances and declining exports. Rising federal interest rates combined with low growth, for instance, can lead to grater pressure on the external accounts and uncertainty for the monetary policy of Pakistan. Findings from an econometric analysis of data from 1991-2016 suggest that real interest rates and real exchange rates increase in response to international demand shocks. However, external demand does not significantly impact inflation or domestic growth in Pakistan. They emphasised that monetary and fiscal policy coordination is essential for the country to fully capitalise the benefits of positive shocks in the external economy. 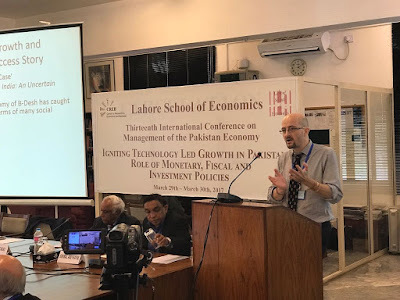 Dr Ghulam Saghir (Assistant Professor, University of Punjab, Lahore) kindly presented research by Dr. Jamshed Uppal (Associate Professor of Finance, Catholic University of America) on External Debt Management and Capital Flows. The presentation discussed recent strong growth in the financial sector of Pakistan and the how it has impacted the capital flows. The authors posit that an increase on the country’s Euro bond yields or an increase in the spread of the credit default swaps (CDS) can be taken to be a measure of the sustainability of external debt levels. An increase in yields, for instance, represents the county becoming a riskier borrower for investors. Post the Global Financial Crisis in 2007-08, yields decrease sharply, followed by a upward trend over 2009-2011 period. There is, however, a general downward trend since January 2012 to the accompaniment of improvements in the credit ratings and decrease in the CDS spreads.Notwithstanding the apparent improvement in the country’s financial conditions, there still seems to be a substantial residual risk stemming from other risk factors which seems to be driving the yields on the Pakistani Euro bonds. 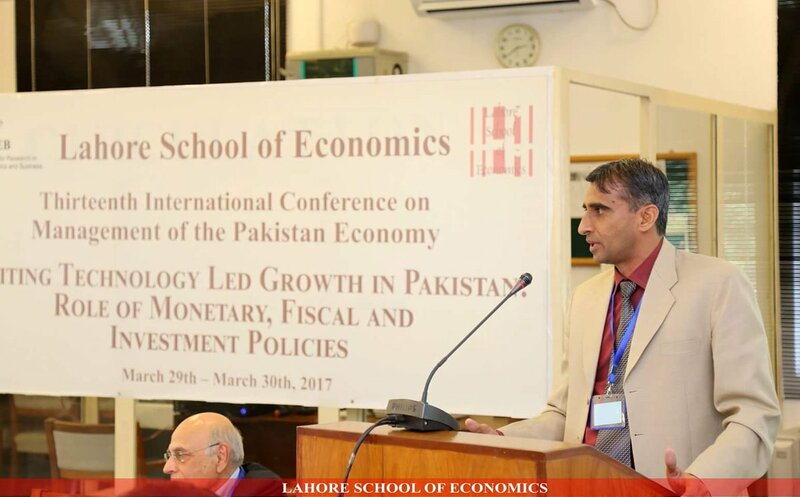 Therefore, the key to further driving the yields lower may be in ameliorating domestic economic, political and security conditions.These key factors may be even more pertinent in light of changing global financial environment and financing requirements of projects such as China-Pakistan Economic Corridor (CPEC). 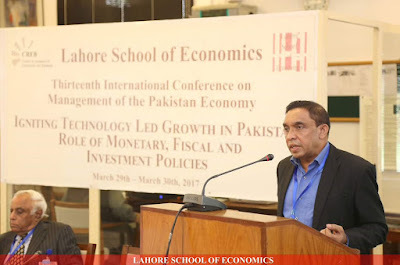 The second session concluded with a presentation by Dr Naved Hamid (Professor, Lahore School of Economics) onhis co-authored work with Ms Azka Mir (Research Assistant, Lahore School of Economics) on Exchange Rate Management, Structural Change and Economic Growth. 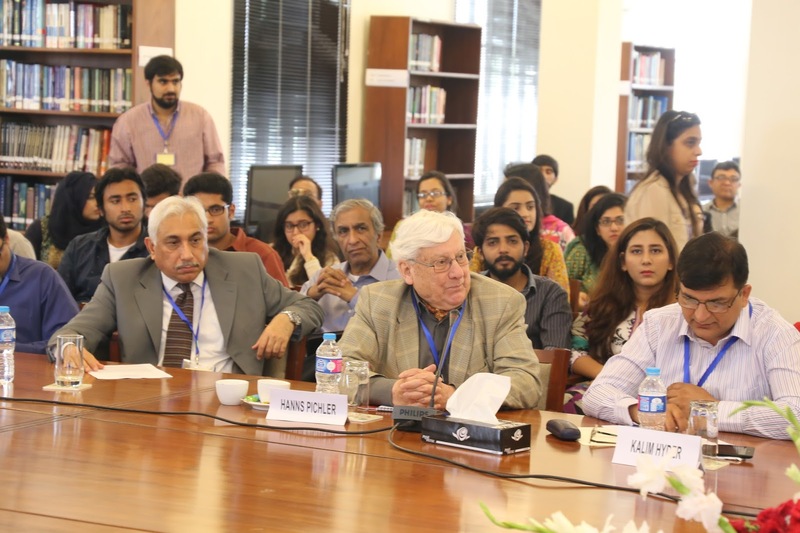 Their paper discussed recent exchange rate management in Pakistan and drew attention to the change in government priorities since 2013, which has switched focus from stabilising the real exchange rate to the stabilising the nominal exchange rate. They conclude that this reversal in policy has had an adverse impact on exports and manufacturing; while non-oil imports have expanded significantly. A balance of payment crisis at this point could bring the present economic expansion to a halt. The last session of the day discussed Role of Fiscal Policy in Economic Growth. 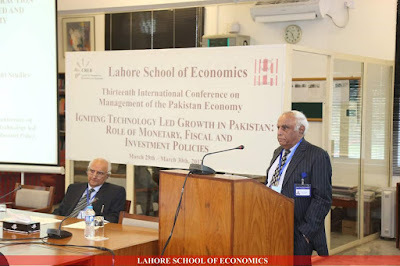 Mr. Shabbar Zaidi CA and Senior Partner, A.F. Ferguson & Co., Karachi) contended that the role of fiscal policy in Pakistan is largely of a revenue collection measure only. It is currently being used as protective tool for traders through the ‘Presumptive Taxation Regime’, where the burden of indirect tax falls on the consumer. A presumptive tax regime, perpetual amnesty and non-availability of asset database have resulted in a tax regime that provides competitive advantage to a large undocumented segment of the economy that lies outside the fiscal regime and has lead to growth that excludes a large proportion of people. Mr. Zaidi emphasised the need for accurate documentation of assets; an idal tax to GDP ratio of 15% by 2025; all sources taxed similarly at a maximum rate of 20-25% on net income taxes by removing all forms of presumptive taxation; removal of dual tax on dividends; and similar sales tax rates under both Federal and Provincial regimes. In summary, the fiscal policy regime should focus on taxing all at a lower rate; rather than the a few at exorbitant rates. The session was concluded with a presentation given by Dr Nasir Iqbal (Director of Research, Benazir Income Support Programme) on his co-authored work with Dr Muslehud Din (Pakistan Institute of Development Economics, Islamabad) and Dr Ejaz Ghani (Pakistan Institute of Development Economics, Islamabad).In particular, they draw attention to the fiscal deficit target set under Vision 2025 and discuss if this arbitrary target is a sustainable in the macroeconomic and institutional environment in Pakistan. 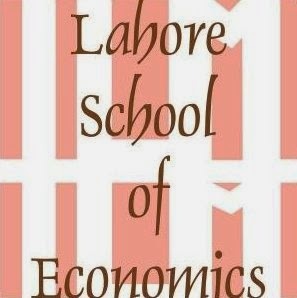 They use econometric techniques to estimate the optimal level of fiscal deficit that can serve as a prudent benchmark for macroeconomic management in Pakistan. 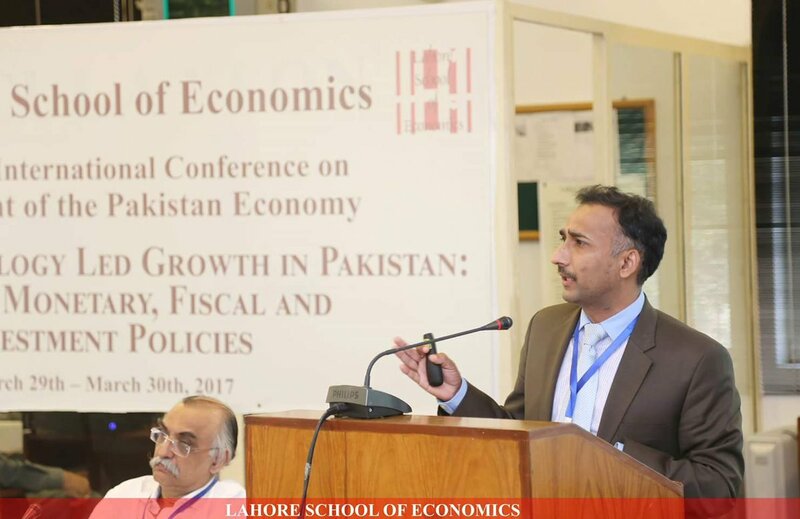 They use data from 1972 to 2016 to understand the relationship between government deficit and economic performance in Pakistan and find a threshold level of 5.57% of GDP for Pakistan. Overall, fiscal deficit has a negative impact on economic growth and has mostly remained above the threshold level. The findings are encouraging and allow room for fiscal policy to be growth enhancing, as long as the deficit is kept below the threshold level and public spending is spent on productive investments with long run growth potential. Discussions on the second day of the conference will focus on the role that trade openness, technology and institutions can play in job creation and equitable growth. 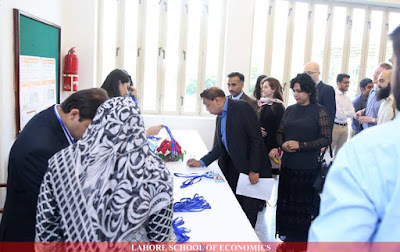 Of particular interest is the work by Dr. Azam Chaudhry (Dean, Faculty of Economics), Dr. Theresa Chaudhry (Professor, Faculty of Economics) and Nida Jamil (Faculty of Economics) on the impact the 2006 Pakistan-China Free Trade Agreement (FTA). The authors will use their results to draw policy related conclusions for CPEC related initiatives. For instance, in their paper, the authors demonstrate that the Pakistan-China FTA has significantly increased the amount of imports from China especially in the sectors that have been left vulnerable because of significant decreases in Pakistani tariffs. At the same time, the productivity and value added of firms in these vulnerable sectors have fallen (and may have the number of firms and employment). Therefore, Chinese imports may be potentially pushing Pakistani producers out of the market in certain vulnerable sectors and the remaining firms are smaller and less productive.The authors also find that though Pakistan has still not been given the same level of market access to China as the ASEAN countries have (since Chinese tariffs on Pakistani goods tend to be higher than those on goods from ASEAN countries), the level of exports in the sectors benefiting from lower Chinese tariffs is increasing (though it has not increased as a percentage of Chinese imports which means that as Chinese imports have grown, Pakistani exports have not been able to significantly benefit from this trend). And the higher level of exports in these potentially benefitting sectors has led to an increase in employment in these sectors. But what is extremely interesting is the fact that firm level productivity and value added in these sectors has fallen (relative to other sectors) which implies that Pakistan’s focus on low value added exports to China may have led to higher exports, this may have been driven by an increase in smaller, less productive firms as opposed to larger, more productive firms. The authors will be presenting their recommendations for CPEC related industrial initiatives in their presentation on Thursday.